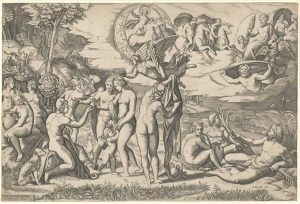 The Judgement of Paris (1510-20) is an engraving by Marcantonio Raimondi (c. 1470-1482 – c. 1534) after a drawing by Raphael (1483–1520). It elicited many keen glances and enthusiastic comments from audiences when it was brought out for both public programs and classes at the Baillieu Library. 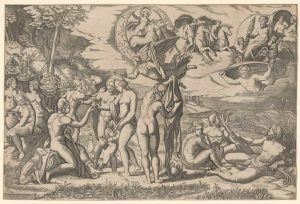 It also proved to be a popular image during and after it was made in the 16th century; some scholars claim that it is the most famous engraving of the Renaissance. It was also sought out by collectors and the Print Collection holds three different copies of this one image. When it emerges from the safety of its storage box, it is typically examined in the context of two key questions: what is it depicting, and what is its significance? One academic recently described it as the forerunner to the Trojan War: a startling contrast to its main subject of a beauty contest. Many of the great ancient world figures are gathered in this scene; the title role plays out at left where the Trojan Paris judges the beauty of the goddesses Athena (Minerva), Hera (Juno) and Aphrodite (Venus). Aphrodite emerges the winner because she offers the most desirable bribe, promising Paris the most beautiful mortal in the world, Helen of Troy, wife of Menelaos, King of Sparta. The union of Paris and Helen is the event which sets the Trojan War in motion. The figures at left are derived from a Hellenistic sarcophagus. [1.] The river gods depicted at right also strike a familiar chord in the canon of Western imagery, as Manet borrowed its composition for his painting Luncheon on the grass (1863). Not only was the engraving a success for its composition and subjects, it also represents a change to the traditional role of printmaking. 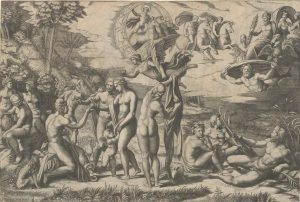 This print is classified as a reproductive print, or one that ‘copies’ another work of art, in this case a design by Raphael that has subsequently been lost. Before Marcantonio entered the printmaking arena, artists were often producing prints as original, albeit multiple works of art. The collaboration between Marcantonio and Raphael opened up a new dimension: the art of reproduction. They embarked upon the business of reproduction, and the repercussions of this intellectual property war are still at the front line of creative practices today. According to Giorgio Vasari, after seeing the prints of Albrecht Dürer, Raphael was inspired to set about his own printmaking venture. 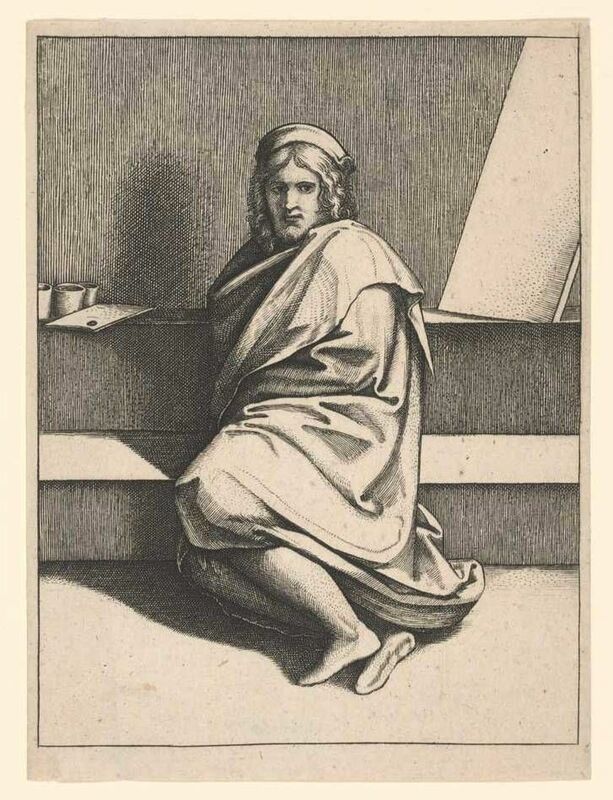 Raphael established a printmaking business with Marcantonio producing engravings after his paintings. 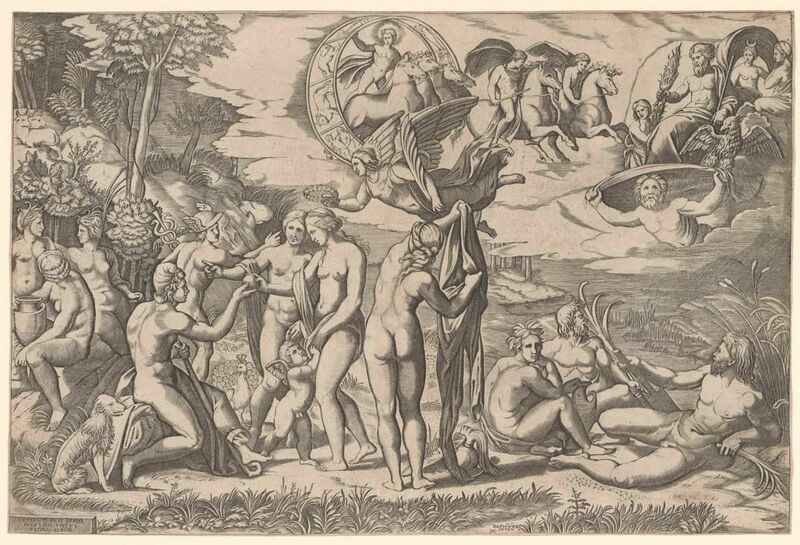 Some, including The Judgement of Paris, were designed especially to be made into an engraving. Their enterprise gave rise to the long history of the reproductive print and the print selling trade. Marcantonio’s chief protégés were Marco Dente (Marco da Ravenna) and Agostino Musi (Agostino Veneziano) who also made reproductive prints, sometimes after their own master Marcantonio. When comparing impressions of The Judgement of Paris from the Baillieu’s Print Collection, subtle differences may be found. The darker impression has been identified as an early impression by Marcantonio, whereas the two lighter versions are careful later copies made by his student Marco Dente. Images such as The Judgement of Paris convey a rich and complex lineage of production and reproduction. The Judgement of Paris is on display in the Arts West lab during semester two.